I’ve been doing more and more lately, or so it feels like. When I compare to this time last year when I was doing a lot of freelance work, going to school full time, working in lab hours, doing non-profit work, and still blogging, maybe I’m doing less. I’m really not sure. Have you ever noticed how hard it really is to compare your now to your then? The situations are always different. The problem is that it’s easy to look at times when I was doing more different things and think that that meant I was doing more overall. More of a single thing, is still more, and that can be too much. During my last semester of collage, I ended up quite sick from doing too much. I missed a lot of classes when Epstein Barr flared up causing fibromyalgia to do the same. I eventually reached a point where all I could do was take my “to do” list and throw it out the window. I find that I end up doing that at least once a year. I try to keep my to do list minimal and keep several days with little to nothing on the list so that I can move things over when needed. But, sometimes I just get so far behind that all I can do is chunk the whole list and start over. Often realizing that much of what was on that list didn’t really need to be there to begin with. On the other hand, there are many things I do each day that aren’t on my to do list. Some days I try to add them onto the list as I go just so that I can keep a record of what I actually did during a day. Most of the time I forget to bother in the midst of just getting stuff done. Blogging – I love my blog. I love interacting with you guys, so that’s not going anywhere. Freelance work – writing, editing, marketing, I do a bit of everything. This is my bread and butter so I have to be careful to take on enough of it to pay my bills but not too much that I can’t do it all. Helping my mom – I try to be there for her as much as I can. When she’s doing well she needs me less, but if she has a health issue I’m her primary contact. Self-Care – No matter what else is going on I have to remember that self-care is important. That means taking time for me, whether it’s just taking a little time out to watch TV or read a book, making sure that I eat properly, juice, etc, and making sure that I get exercise (whether it’s 20 minutes on the treadmill or an hour our chasing Pokemon). And, let’s not forget time to just have fun and spend time with my husband. And, of course the occasional lunch or dinner with friends. Remodeling – I’m in the process of getting my house ready to sell and that takes work. Housework, etc – let’s not forget this, as much as I’d like to. This list is a shorter than it has been in years previous when school was on it, or even a couple of years ago when I was running Chronic Illness Bloggers. But, really that doesn’t mean I’m doing less now. It just means I’m doing more of some things and less of some others. I’m sure there’s more stuff that I am doing that I forget about. We really don’t think about how busy we are in until we stop and lay it all out like that. I’m betting even those of you who feel you are barely functioning due to your illness probably do way more than you think you do in an average day. I remember a conversation I had with my mom. I had to take her to the doctor because she was suffering with shortness of breath. And, that pretty much sums it up – It feels like it does at the time. We start doing one task and then we see something else that needs done so we do it, and before we know it we’ve worn ourselves out doing things that either a) didn’t need to be done at all, b) could have waited, or c) we could have asked someone else to do. Sometimes I reach the point of doing too much and I know it. It’s obvious that the only way I’m going to stop freaking out about all that “needs” to be done is to scrap the whole list and start again. Other times, the picture isn’t so clear. But, there are signs, signs that it’s time to slow down and start over. 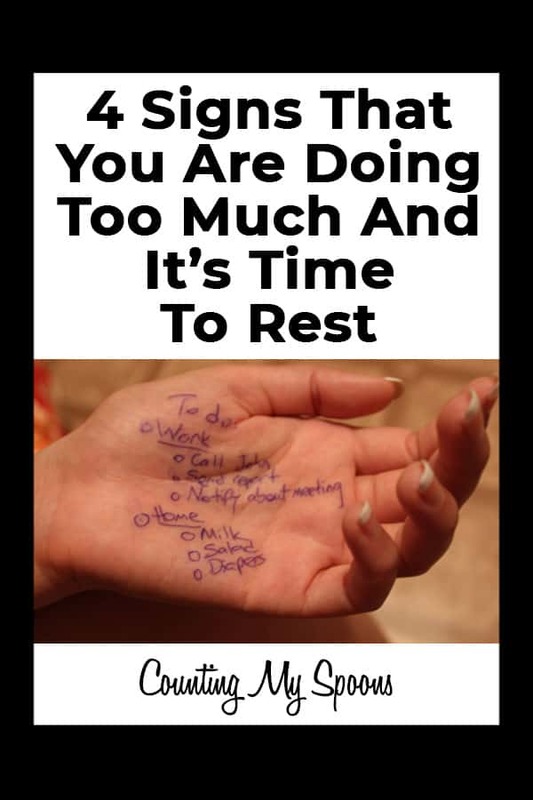 Signs that it’s time to rest. But, what are those signs? There are a lot of weeks when I feel this way and manage to work my way through by simply breaking things down into manageable chunks. Usually, I find that I feel this way most often when I’ve let things sit. When my Todo list from Friday didn’t get done and I didn’t sit down on the weekend to make up for it. What I’ve learned is that the best thing I can do is make sure that at the end of my day, any items that were not completed are moved to a different date. It’s not always tomorrow. Sometimes I know that there’s no way anything is getting done tomorrow. Often it’s a week or two from now. Sometimes, it’s never. 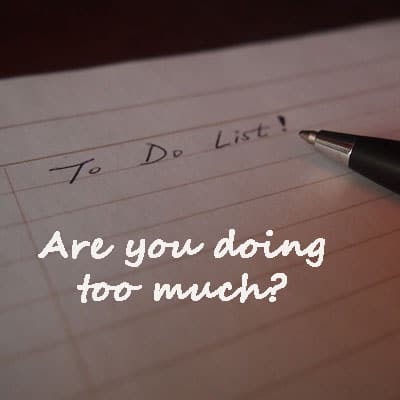 Have you ever had those items on your Todo list that just keep getting shoved back? You stare at them and they make you anxious because you’ve not gotten to them yet? It’s time to take them off the list. They probably don’t really need done. In many cases, they are things I’d like to do at some point but they aren’t pressing. 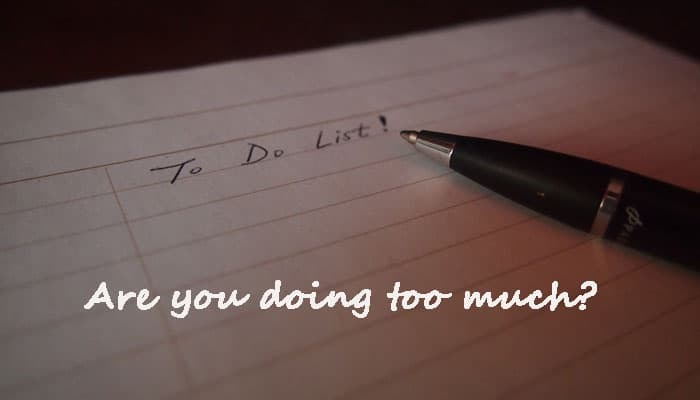 So, why do I put them on my Todo list and make them more important than they are? Why do I give them power? There are times when my need to please takes over. I want to make sure my mom is well and that I’m there if she needs me, but I also have work to do, and what about friends? When will I see my friends? When I was married that was another layer to deal with. I felt that he had to be a priority so I struggled when I wanted or needed to do anything else. I’ll admit the first few months of mom being ill this is pretty much what happened. My whole focus was split between her and work. When I wasn’t helping her, I was working, and then I was feeling guilty for not spending enough time with my husband. So, I made sure that when he was around I could be with him, which left little to no time for myself, let alone for friends. Luckily, my friends understood what was going on. They knew I was swamped. But, that didn’t make me feel any better. I mean part of self-care is spending time with friends and I was in need of some self-care. Thankfully, things eventually calmed down and I was able to balance things again. I don’t have to make everyone happy and the truth is that making everyone else happy doesn’t really make me happy. I do, however, have to make sure that I’m taking care of myself and that I’m doing what I can for those around me within my boundaries. Too many days I feel like I’m just running from one task to another and at the end of the day I feel like I’ve accomplished nothing. Not a thing has been marked off my precious Todo list but I’ve done a lot. I just have no idea what I’ve done. In the midst of that I’ve not taken one second to enjoy my day, to slow down, to think, to process. Oddly enough, I’ve found that when I start the day on the treadmill looking out the window at my backyard and maybe listening to a good TED Talk, that I work through the day much better. I’m able to get things done and know what I’ve done. I’m able to take things at a reasonable pace and to stop and enjoy the moments in my day. Self-care, once again, for the win. Sometimes I forget my priorities. I forget that in order to help someone else I have to make sure I’m taken care of first. I’ve learned it’s important to schedule a little “me time” into my week. Whether it’s a lunch with a friend, an afternoon movie, or just some time walking in the park; if I spend all my days working and focusing on everyone else’s needs I lose track of me, and I get buried. I get stressed and overwhelmed. Thankfully, I’ve found many ways to slow down and refocus in the last year or so. Meditation has helped greatly. Maybe things haven’t really slowed down, they just feel like it. As one thing has been removed from my responsibilities, another seems to grow to fill the void. But, I have learned to better prioritize my time, to make sure that I’m not overwhelming myself and that I am taking time for me. I’m constantly working on taking a slower approach to things to realizing that not everything has to be done right this second, if at all, and that it’s OK if things don’t work out the way I expected (or at all). I’m sure that with so many other roller coasters of life I’ll continue riding this one for quite a while. I’ll have it figured out only to over-commit again and struggle, and throw my todo list out the window and start all over again. Life is a constant process, it’s understanding the process that’s key. “I can’t go back to yesterday, I was a different person them.” I try to accept that I have a new normal. That if I do everything I used to do and still want to do I will reap the cost. Sometimes I do a cost/benefit analysis. That looks like: If I spend an afternoon shopping with my grandchild I will spend two days in bed…is that worth the cost? I know my priorities may be different from someone younger, but I do try to make my husband first on the list, then children and grandchildren, friends, church. The “me time” is whenever my body insists, and I know I need to be proactive with self care. Thank you Julie for sharing your struggles and the demands on your time. I think you are doing a great job. I so enjoy reading your blogs Julie. It helps me to realize that most of what I am feeling/going thru is “normal” for fibro sufferers. Recently I have been feeling very sorry for myself because I cannot seem to do everything I want to do or use to do. Especially this time of the year, I enjoy going to little towns and walking through shops, fall festivals, etc. and I have found that I am only good for about 30-45 minutes before pain sets in hips and lower back. I keep on moving as much as I can though, and pop a pain pill if it gets too bad, but that just takes all the fun out of the activities. Last weekend I went shopping for a Mother of the Bride dress for myself with my 2 daughters. I settled on one just so I could be done with shopping and trying on dresses after 3 hrs. This was my 3rd time out trying to find a dress because the other two times were very short lived due to pain. This makes me very sad because this is my last child to get married and it seems that I am not able to enjoy the process as much as I would like too. I put on a good face though 🙂 with makeup, hair and nice clothes, but inside I am miserable. Thanks for making me see that others are going through the same crap……. I’m so sorry you didn’t get to enjoy that part of the events as fully as you’d like. I do hope you ended up with a nice dress though. Shopping is tiresome even on a good day for me, but I’ve never been much of a shopper. I hope you’ll be able to really enjoy the wedding, just remember to pace yourself and have fun. I can identify with this so much! Thank you for all you do for the Chronic Illness Bloggers. You are such a help and an encouragement. I don’t know how you keep up. I write one blog post a week and it wears me out! Kudos! I have my moments. Sometimes I don’t write any, other weeks I write several. I’ve just learned to schedule well.